Learn how to draw a mandala! In this drawing lesson, I'll show you how I constructed the colorful mandala you see above. Although it looks complicated, it's actually quite easy, once you know the steps! A mandala is a complex abstract design that is usually circular in form. In fact, "mandala" is a Sanskrit word that means "circle". Mandalas generally have one identifiable center point, from which emanates an array of symbols, shapes and forms. Mandalas can contain both geometric and organic forms. They can also contain recognizable images that carry meaning for the person who is creating it. In essence, mandalas represent the connection between our inner worlds and outer reality. Designing your own mandalas can be both inspirational and therapeutic. Are you looking for printable mandala coloring pages? I've got 23 hand-drawn mandala designs to color, just for you! My ebook of Mandala Coloring Pages is perfect for those who want ready-made, blank mandala designs to color. If you want to learn how to create your own mandalas, continue reading my popular mandala-making lesson below! When you create your own mandala, think of it as an echo of your soul. Drawing and coloring a mandala can be a highly enriching personal experience in which you look inside yourself and find the shapes, colors and patterns to represent anything from your current state of mind to your most deeply-desired wish for yourself, for a loved one, or for humanity. You can design a mandala to symbolize a state of mind that you would like to achieve. Mandalas are great tools for meditation and increasing self-awareness. Many different cultures around the world use mandalas in their spiritual practices. The best thing about designing your own mandals is that you have the freedom to choose whatever shapes and colors that you feel express your sense of self and your view of reality. Your mandala is yours, and you have the freedom to use your creativity to create a mandala drawing that is uniquely you. Once you know the basic steps of how to draw a mandala, you can try now new designs and new colors each time you draw a new mandala. You don't need many materials to learn how to draw a mandala. All you need is: paper, a pencil, a ruler, and an eraser. To color in your mandala: your choice of colored pencils, watercolors, crayons, or any other type of art material for coloring. You can also use a compass if you like - this will be covered in the steps below. 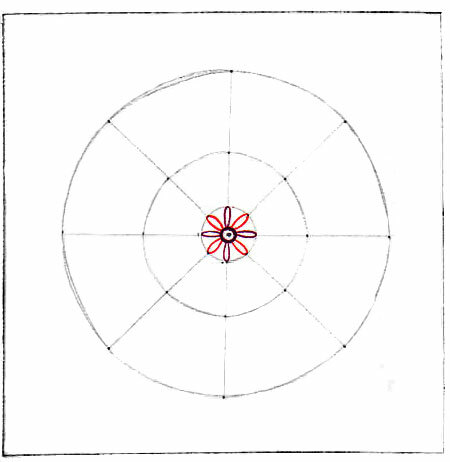 The first step in how to draw a mandala is to measure out your paper into a square shape. The square can be as big or as small as you like. The bigger the square, the more room you will have for putting in lots of detail and color. I made my square 8" x 8". 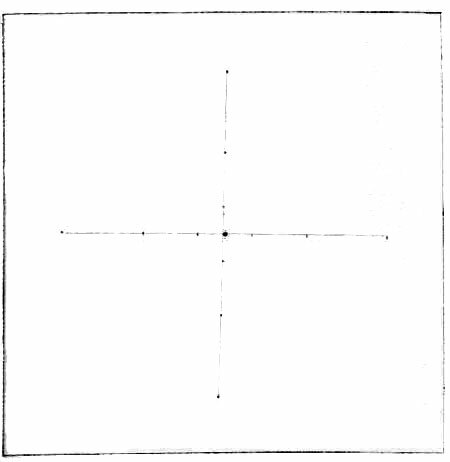 Next, use your ruler and a pencil to draw a dot in the very center of the square, as shown above. Using your ruler, measure out 1/2" (or more or less - depending on your preference) from the center dot. Make a mark 1/2" above, below, to the left and to the right of the center dot, as shown above. Next, measure out another distance from the center dot. I chose 1.5" from the center dot. 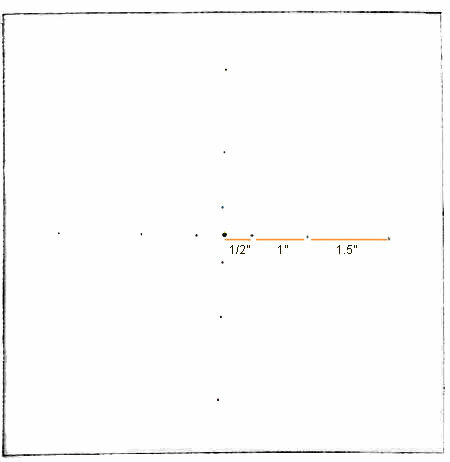 Using the same process as before, make a mark at this same distance on top, below, to the left and to the right of the center dot. You can continue making as many rows of these dots as you like. I chose to make 3 rows of dots, as you can see above. The important thing is to make sure that the dots you make are all equidistant from the center dot. Now that you've drawn your dots, it's time to connect them. 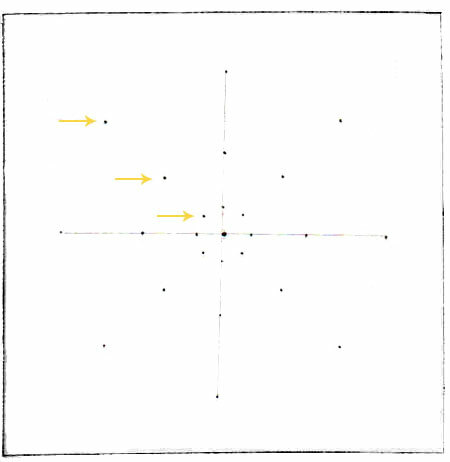 Draw a straight vertical line connecting the dots that go up and down, and a straight horizontal line connecting the dots that go one either side. See above for an example of this step in how to draw a mandala. 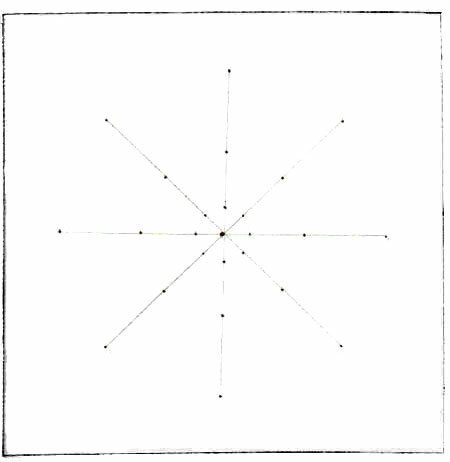 Next, draw another series of dots at the same distances from the center as your first series of dots. See the example above. The yellow arrows point to where the new row of dots will be located. Try to make them at a 45 degree angle to the perpendicular lines. Draw four rows of dots, making a large x shape. See the example above. Next, use your ruler to connect the dots you just made. Now your picture should look like the picture above. Now you'll want to connect the dots into circles. To do this, start at one dot, and draw a curved line to the next dot, and so on. Don't worry about making the circles "perfect". We're not worried about perfection here! Just take it one step at a time, going from dot to dot. It's okay if you make mistakes. In the example above, you can see 2 instances in the outermost circle where I made a mistake the first time around. If this is your first time learning how to draw a mandala, trust me - it will be even easier the next time you do it. Just make sure you draw lightly enough that you can easily erase any mistakes. Tip: If you don't want to take the time to sketch out your own circular grid, you can download and print your own polar graph paper. This is great for sketching, but if you use this graph paper to create a finished piece, remember that you'll still have those little blue lines underneath your mandala. When you draw your own grid, you can erase the lines! Now that you've drawn the basic outline for your mandala, you can begin drawing designs in your mandala! You can use a pencil, colored pencils, ink, crayons, or whatever you choose. I chose to use two different colors of colored pencil to draw in my design. You can start from the center, or you can start from anywhere where you feel inspired to make some marks. Using the lines and circles you drew as guidelines, you can draw shapes like circles, triangles, raindrops, loops, etc. The important this is to repeat your pattern. For example, if you draw a circle on one of the lines, be sure to draw it in the same spot on the other lines. This creates repetition, which is a key element in creating a mandala. 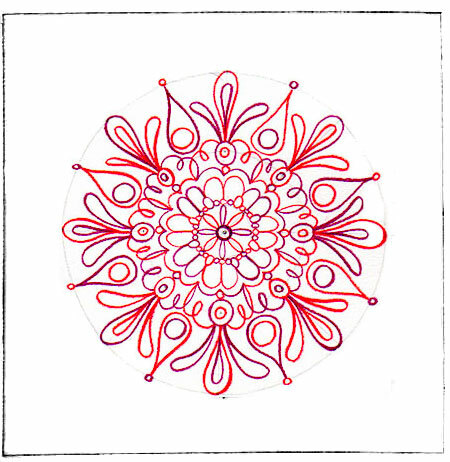 As you draw more and more designs, your mandala will start to look more complex. The key is to take it slowly, drawing one shape at a time and going around the whole circle drawing that one shape in the right place. 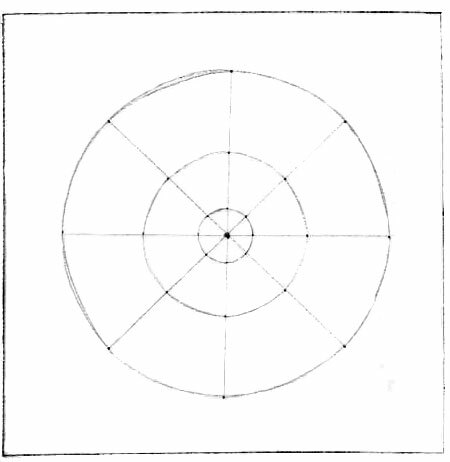 Then you build on that shape by drawing other shapes around the circle in the same manner. Here is how the mandala looks with all the designs drawn in. Pretty cool! You can leave your mandala just like this, or you can choose to color it in. Voila! Here is my finished mandala. Using watercolors, I colored in the design using colors that were soft, introspective, and uplifting. Now you know how to draw a mandala! Coloring mandalas can help center your mind while nurturing your soul. 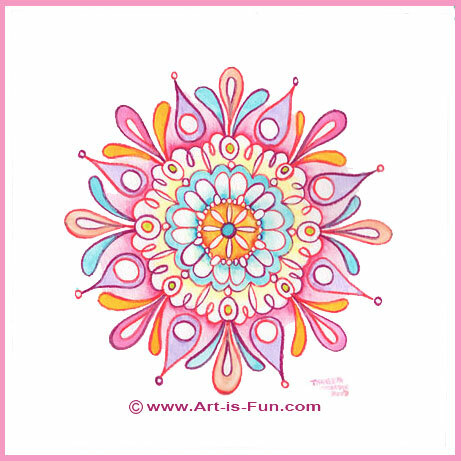 If you want some ready-made blank mandalas to color, check out my special book of 23 hand-drawn Mandala Coloring Pages that you can print and color over and over! Not sure yet? Try before you buy with these free mandala designs to print! If you like my abstract art, check out my printable Abstract Coloring Book with 20 pages of intricate abstract line art to fill in with COLOR!